« $36 Silver- The Bankster’s Waterloo? Not all Germans were Nazis. Not all Nazis were German. Not all Jews are Zionists. Not all Zionists are Jewish. This is a controversial topic for sure. Just because it makes people uncomfortable doesnt mean its untrue. Just because horrible things were done to the jews during ww2 doesnt mean they can do horrible things to others and not be criticized because its “antisemetic”. Get over it. Like Patrick so elegantly pointed out. The Zionist Jews in control of Israel right now are not even Jews. They are Khazar Jews. Not even Semites. If you want to know what that means ladies and gentle do a little research on a little know empire called the Khazar empire. Or read a book called the thirteenth tribe. There was even a recent DNA study PROVING that most of the “Jews” in Israel are not Israelites. But even then, that DOES NOT MATTER. So they stake a claim to Israel, the Indians have a claim to this land (USA). So what is it with some of these Israeli supporters, might equals right? Modern day Zionism is modern day Nazism. For those of you that fail to recognize it as such, they it’s your loss for not seeing the world how it really is. And Jews are NOT god’s chosen people. We are all children of god he/she/it does not play favorites. Thanks Silver Shield for reminding us of this continuing tragedy. It is a shame that so many politicians; and, uninformed Evangelicals actually support Criminal Zionism. My response to their sanctimonious apology for such evil is to ask them if they love israel so much- why not just get out of the this country and put your love into action? The pro-zionists are a plague on our land. Ask yourself, if certain American Jews think Israel is so special, why are they living in America? Aren’t they disobeying God by not living in Israel? For the Christian-Zionists, I suggest you check out the $70million+ per year charity called “IFCJ.org” – Rabbi Eckstein is happy to take your donation to help OTHERS make aliyah to Israel; he himself lives in Chicago and pays himself $400K per year to run the charity. A tough job, but someone’s gotta do it! Damn fine collection of pictures Silver Shield. The irony of “God’s Chosen” as racist ethnic cleansers passes by less with every passing day. Q – Guess who the Israeli shill is? Lulz. Learn some history “Son of Germany” – unless you really are a son of Hitler’s Germany as Hitler is the father of Israel. Lord Balfor is the grand daddy of Israel. More so called Israelites enabled the rise of Nazi Germany than any Muslim or Arab. Thank you Lord Rothschild, Mr. Harriman and your political supporters in the Vatican. Liars, cheats, crooks and murderers. That is their game. The political supporters of Zionism are the foremost enemy of peace in the world today. Zionists also happen to run the world’s central banks. Coincidence? I don’t think so. wow this is confusing and hard to follow and know the truth?? I need a lot more scripture proof to be convinced from the teaching’s of Jesus OT or book of revelation ? Pictures can be manipulated ! …..That’s exactly the point; it has already been manipulated into a “jewish” fable, which Scripture had warned us against… do you have any specific questions? If a man shoots at you from a school building full of children and you shoot back and a child dies who is responsible in your opinion? These Palestinians fight their wars behind women and children and then cry foul when the innocent are killed and injured. The ruthless Zionist is the 3 month old in the picture stabbed several times by our brave and noble Palestinian warriors. Palestinians celebrating the massacre of the Fogel family. You remember them, the same ones that danced in the streets when 3000 innocent Americans were butchered by their brother Muslims on 911. I guess the Zionists did something to deserve this. God forbid they should want to strike back and show their aggressive true colors. What is missing in your argument is that this is most likely the act of one individual psychopath. What Israel does in response is institutionalized, ruthless and indiscriminate. The whole point of both articles is that the US should stay out of entangling foreign alliances on BOTH sides. Murder does not cease to be murder when the weapons are by governments with bombs. For every one Fogel family there are probably hundreds of Palestianian families that have had their lives shattered. Put out all the pictures that you want it does not prove a thing. Women and children have always and will always bear the brunt of war and it is always a tragedy. The question that you are avoiding for good reason is how did these children get injured. Were they targeted like the Fogels or were they collateral damage because a freedom fighter used them as shields. If that is the case then who bears the blame. When in doubt ask yourself this question, What would George Washington do? Silver Sword, thank you for proving the point of my article. You should share this intelligence with the Palestinians they sure could use it. I mean you would think that having mossad agents right next door firing missles into Israel would be a tip off. I mean here are these guys wearing mossad uniforms and badges and those funny mossad hats in your neighborhood shooting missiles and the Palestinians are clueless. you need to get over there right away, your people need you. Oh and don’t forget your meds you don’t want to go off of them again. Good grief my entire post was about Israel and the Palestinians and the right of Israel to defend herself and you quote GW about foreign entanglements. You seem to be very confused. Defending yourself from missile attacks is not a foreign entanglement it’s war. This article if you will go back and look at it, was about Nazism and Zionism being equivalent in your mind at least, not foreign entanglements. You got to wake up before you can wake anyone else up my friend. you also refused to answer any of my very simple and direct questions which makes you either disingenuous or a coward. The point of the Nazism vs Zionism pictorial essay it to show the irony of how the formerly abused turn into the abuser. The point of the Beware of the Zionist Presidential Candidates article was for the US to stay out of entangling foreign alliances. Would you like to review the video where the Zionist godfather sought to undermine the Oslo Peace Accord or how he was going to manipulate the US or how they were going to steal Palestinian lands? Still haven’t answered the questions. still confused as to what article you are responding to. Don’t care about what Israel does they are no better and no worse than any other corrupt nation out there including ours. Imagine you are GW and president of the US today. You get a 3 AM phone call, “Mr. President we have rockets being fired from Tijuana into San Diego, some Mexican psychopath that we created has a whole stash of non government purchased rockets what should we do?” tic toc tic toc. Yes they have a right to defend themselves with equal and proportionate means. Just like the Palestinians have a right to defend themselves. In the case of the Fogel family the police should capture the murdering criminal and not invade, attack, or destroy a nation of people not involved in the crime. Shameful post. With all your ranting about “elitist”, you’ve fallen in perfect boot step with them with this anti-semtic post. Do yourself and the people that follow your blog a favor and educate yourself. The land provided for Israel thru the Balfour Declaration of 1917 was for land that was barren and worthless in the site of Palestinians and other Arabs in the region, and not until Jews(approximately 360,000/40,000 non-jewish) began immigrating between 1920-1945 did they turn this desert and swamp land into habitable and productive property. Look at a map and see all the surrounding enemies of Israel and blame them for the Palestinian problem and their lack of concern for their countrymen; where are they to offer land and a home for these people? No, the Palestinians are the ponds and Israel the scapegoat for all that ills the middle east. Get on the right side of America because as Israel goes so goes the U.S.- They’re are only ally, ya dunkopf! You can spare me the anti semitc game I am fully aware of the anti Semitic trick of name calling anyone that disagrees with the Zionist cause. I know full well about the Balfour Declaration of 1917 when the Rothschilds forced England into committing to them a piece of land out in middle east that less than 1% of the population was Jewish. It may have been worthless land to you but it was not to the hundreds of thousands of Palestinians that have been forced from their homes in this racist manifest destiny. And miraculously through a lot of debt and war the Rothschilds got what they wanted. Gee I wonder how that happened? Israel is such a great ally right and yet they are the only state to attack American militarily please look up the USS Liberty. Thanks for your response. Point taken on Spielberg having the same initials. As to “Very childish”; I would hardly view someone connoting the SS reference as childish unless you also believe Hitler’s response to the Jewish question as one of “race relations” and not an attempt on complete genocide. It was meant to drive home the very argument you make of Israel, and whomever else is in the cross hairs of your “Bad Guy for the Day” blog posts. I will say that using ink is a lot more peaceable than bullets unless some mistake your comedic blather as the gospel truth and decide to act upon it (strap a bomb on?). Agree to disagree, we will. On the USS Liberty- ? Because Johnson couldn’t figure out a better way to get the U.S. involved with the Six Day War other than to sink our own ships with the assistance of Israel only points to how evil Johnson was and to what ends he would go to accomplish his interests. But we already knew that…Nov 22, 1963. Last, thanks for the info on silver. THAT”S GOOD STUFF! Being a neutral observer on this issue I have found that the governments of every country on the world always try to manipulate the way the people thinks about important issues. Previous and during the Irak invasion, the media propaganda was so big that if you ask almost any American, they would tell you that they came to help the Irakies and because they had weapons of mass destruction, they do not even know these weapons were never found. it is the same thing with the Israel/palestinian conflict, how much of what the media is saying is the truth?, and how much it is not?, every intelligent and informed person would see clearly how the corporations and the government of the US are lying , the evidence is everywhere. How much of what the media on Israel is saying is the truth?. why can we doubt a government and not the other?. On Mexico during the 1968 student massacre, you only needed a “provocation” , an attack to the public forces, and get rid of the problem, you just need somebody on the government to order an attack to the public forces, and you will get a new truth created. one truth that the majorities will believe. 3. the public forces had to massacre the students on self defense, check. a new truth was created. How many of the Palestinians attacks were created and how many not?. does a universal truth exist? one in which the Israeli are 100% on their rights, or there may be a 70/30, 40/60, 60/40, 90/10, 10/90 ratio between the rights of both parties? lets say I have a supreme intelligence and know that the ratio is 60/40 , this would mean that the Israeli are right on their point of view on 60% of the issues, and the Palestinian on the other 40%, does this means that the Israeli have to keep 100% of the land, the land was not theirs to begin with. It was given after WWII, on what human rights for the people that lived there, why not give the Israeli a piece of inhabited Australia?, or an inhabited parts of the Baja peninsula on Mexico or part of Alaska, the fact that they were given that land it was because it had been their land 2000 years ago, and it proves mediation by powerful entities to make it so. those same powerful entities will go beyond reasonable means to make sure to prove that was the best decision, obviously it was not. I do not have any side for the parties on this conflict, I only have the human side, and whatever reason both parties have for fighting , there isn’t any reason to condone the killing of innocents for both sides. We could also probably do the same thing with American soldiers in Baghdad, have you seen the Abu Grahib pictures? Israel and Palestine have been mortal enemies for thousands of years. How dare you compare that strife with what the Germans did to Europe!! And not just the jews, they started with invalids! Any-one who wasn’t the perfect German was one day to be herded to the gas chambers! Is that what the Arab nations fear about Israel??? Really??? Grow up and stop adding to the hate!!! It’s amazing how there’s no common sense among so many of the respondents. There is no difference between the Germans who massacred human beings, and Israelis who massacre human beings; they’re all murderers, plain and simple. Get the religion, the nationalism and the silly patriotism out of your heads; we’re talking murder, no matter who commits it. Look at the pictures. Take a big dose of common sense and quit believing the garbage you get from all governments. Good job, Silver Shield! Dont miss the fact that Hitler’s Nuremburg laws against the Jews were actually derived from Jewish racist ideology. In short they were a German version of Jewish law. This from the Feurer himself. These pictures are to show that there is a huge difference in what is being told about Israel and what is really going on in Israel. Zionism is another collectivist, fascist and racist ideology and is not something to blindly follow just because they say so. I do not curse Israel, I only wish that America follow a non intervention policy recommended by our founding fathers when they said commerce with all, allegiance to none. We are broke and we need to not be sticking our noses in the worlds business. You mention the chosen people, please do yourself a favor and look up Revelation 2:9 and tell me what Zionism is again? Jesus shows that we are all chosen people and the same money changers he threw out of the temple are controlling the world today spreading debt and death. 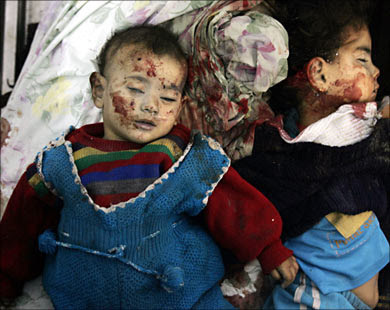 1991-2003- Sanctions on IRAQ killed 1.5 MILLION IRAQI CHILDREN!!!!!! also one of reasons elqaeda attacked USA done through puppet us govt heavily endorsed by AIPAC. 2001- 9/11 israel had people in CIA that allowed for binladen to attack USA he did bc of reasons mentioned above but they allowed for this to happed so USA can retaliate and attack iraq and afghanistan for israels interest and build bases to protect israel while us does fight dying. Great job Silver Shield. I wish people would research the information about the origins of Zionism and the Khazar conversion to Judaism. Not all Jews are Zionists and not all Zionists are Jewish. How profound that the same can be said of Germans and Nazis. Unfortunately our Christian churches are promoting support for Israel thinking it is in some way shape or form supporting a Holy entity. The 1948 ‘State of Israel’ is a hoax. If anything it has become the Synagogue of Satan. Zionists are who we need to fight and exterminate ! They have infiltrated the American Government and Congress and are wielding the American Military as a club against all THEIR enemies ! Iran is not the enemy of America but they are the enemy of the Zionists , in other words , they are OUR allies ! MILLIONS have died fighting wars for the Zionists , NO MORE ! Hitler was easily winning WW1 and on TWO ocassions tried to get Britain to admit defeat so things could get back to normal . Britain was just about to when the Zionist Jews came to them and said if we can “TRICK” America into joining the war , Germany could be defeated . A deal was struck , the Jews would announce through THEIR media that a ferry , the SS Sussex was sunk off Dover by the Germans killing 38 Americans (Total lie). Americans charged to war and Germany was defeated , the payment for the Jews services was Palestine and the Balfour Agreement is the receipt for the transaction . America getting sucked into WW2 was another Jew job by way of Pearl Harbour . Many other false flag attacks have occurred since including 9/11 which brought them undone . The entire world knows they did 9/11 and we have been showing our rage more and more for the last ten years . I swear on my life to the dead , wounded and loved ones left behind we WILL avenge you ! 3000 souls are still trapped at ground zero that need closure so they can move on , their lives so quickly snuffed out by Bush , Blair , Cheney , Wolfowitz , Rumsfeld , Rice , Pearle , Zelikow , Silverstein , and hundreds more Zionists , they have been trapped at ground zero . We do not need to fight their armies or their police forces , just remove the cuckoo’s that have infiltrated your Government . The tribe of Judah remained in Jerusalem, and although they were also taken captive they were returned to Jerusalem several hundred years before the time of the New Testament. After the Jews (tribe of Judah) rejected Christ, they were scattered once again, this time by the Romans . The country of Israel is NOT the same as the house of Israel. The 10 lost tribes have been scattered among the nations of the earth, and many of them came to America, which is a promised land like the land of Israel. The entire house of Israel is God’s chosen people–blessed with freedom and prosperity, but bound to obey the laws of God. We are in such desperate straits in America because we have abandoned the laws of God in favor of an atheistic system in which every person seeks his own interest (rather than seeking the welfare of his neighbor, as Christ taught). Like the Jews at the time of Christ, we have been tricked into rejecting the Savior in favor of an idolatrous religion of greed (moneychangers in the temple – ATM machines in our churches). If you doubt it, look at the symbol of our stock market–a giant metal bull. Read Exodus 32. Sound familiar? At first I would have considered following your silver advice which I read on another post here, as it appeared sound. Oh, I may still buy but not on your advice. Because now that I know you are a Jew hater – I won’t dignify you with the phrase ‘anti-Semite,’ because unfortunately even Arab terrorists are Semites – I know what kind of person you are. And juxtapositioning photos of the Holocaust with the selective photos of Israelis DEFENDING THEMSELVES from attacks by Arab terrorists! That is horrendous, especially since on a DAILY BASIS INNOCENT ISRAELI JEWS ARE TORCHED, AXED AND KNIFED TO DEATH by your Arab friends. You don’t read about that in your NY Times or London Guardian, but it is not only verifiable but I know people living in Israel who are faced with this day in and out. The Fogel family massacre is only one news account – most murders of Israelis are ignored by the media. BTW, there’s a huge difference between what your Nazi pals did (targeting the entire Jewish population for extermination) and doing what the Israeli IDF are desperately trying to do(trying to protect Israeli men, women and children who are citizens in their G-d given land against continuous attacks). You are right about one thing…not all Nazis are German. You aren’t German, are you? Biblical Jews have nothing in common with the war mongering Zionists in charge of Israel. If you are a Bible reader look up “the Synagouge of Satan” and judge the Zionists by the fruits of their tree. As far as my background, I am an Irish American who believes that the US should bring home our troops and let the world solve their own problems because we are broke and have too many problems ourselves. As far as silver the logic I use to break that issue down can be applied to the Palestinian issue. when jews were forced to leave their houses . The Jews who lived in Palestine before the Balfour declaration had very good relations (they would babysit each others kids) and lived in harmony with their Arab neighbors.